On Saturday, October 24, 2015, a delegation from Bradly University that included Interim President Dr. Stanley Liberty, Vice President for Advancement, Jacob Heuser, as well as Interim Dean of the College Of Education and Health Sciences and Associate Professor of Nursing Dr. Molly Cluskey, visited Savannah to induct Dr. Clyde W. Hall into the Bradley University Centurion Society. The delegation from the Bradley Campus in Peoria, Illinois was joined by Savannah resident, Jerry Stephens, who is a former Bradley Trustee. The Centurion Society is an elite group established in 1982 to recognize Bradley University alumni who have brought national and international credit to the University. It includes those individuals who have achieved Bradley’s highest alumni honor, the Distinguished Alumnus Award, as well as other alumni who have achieved great honor in their fields and have thus served as examples of commitment and excellence for all Bradley alumni and students. Dr. Clyde Woodrow Hall is the 188th graduate of Bradley University to be honored by membership in the Centurion Society. 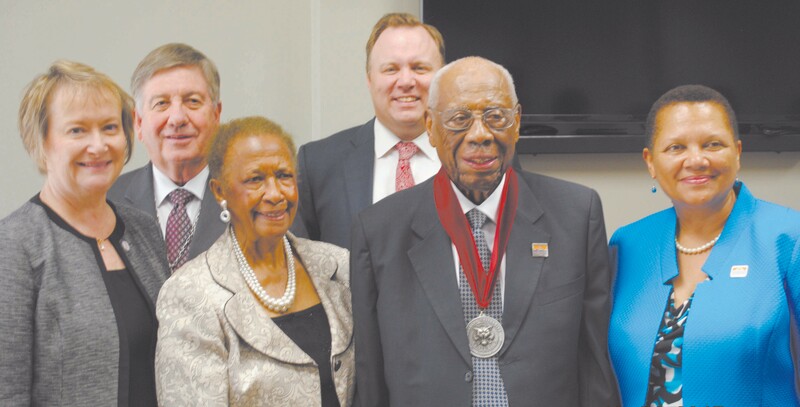 According to President Stanley, the induction of Dr. Hall represents the first time that an alumnus has been inducted away from the Brad- ley campus in Peoria. Dr. Hall earned his ED.D Degree at Bradley in 1953. He is currently a University of Georgia Regents Professor Emeritus in the field of Engineering Technology. Prior to serving as Acting President of Savannah State College (now University) from 1978 -80. Hall was a Professor and Department Chair of the Department of Engineering Technology at Savannah State. Dr. Hall, now retired, has served on numerous community boards as a very active member of the Savannah community. He is the author of numerous papers and books, including One Hundred Years of Educating at Savannah State College, and An African-American Growing Up on the West Side of Winter Park, Florida 1925 – 1942. He is credited with developing a plan for the desegregation of Savannah State College which the Board of Regents approved and incorporated into a plan to further desegregate the University System of Georgia. Dr. Hall received the King-Tisdell College Foundation’s Beach Institute Education Award for his part in preparing students for careers in science and technology. Among his many noteworthy accomplishments, on January 28, 1963, Hall became a charter member of Alpha Mu Boule of Sigma Pi Phi Fraternity. Hall is the only surviving member of the chartering group of this distinguished fraternal organization. Dr. Hall said that while teaching in 1949 at Arkansas A & M College for $300 a month with a master’s degree, he learned that other men doing the same job were being paid $500 a month because they had terminal degrees. He joked that it was for the “big bucks” that he pursued his doctorate degree at Bradley University. The Induction Ceremony and luncheon was hosted by Savannah State Univeristy President Dr. Cheryl Dozier and held in the President’s Dining Room in the King Frazier Student Center.